In September 1998, NIDA awarded a competitive contract to Westat, Inc., a health survey research company, and subcontracts to The Annenberg School for Communication, University of Pennsylvania, and the National Development Research Institute (NDRI), to undertake a science-based evaluation of the National Youth Anti-Drug Media Campaign sponsored by the ONDCP. During the development year (1999), Westat and colleagues designed and implemented a nationally-representative household survey of youth and parents living in the same household, entitled National Survey of Parents and Youth. After Round 1 of interviews, which occurred in Waves 1, 2, or 3, youth and parents were re-interviewed three additional times, approximately once a year, in regard to exposure to the Campaign through June 2004. Westat has produced produce semiannual, annual and special reports that provide data on the impact of the Campaign on attitudes, beliefs, intentions and behaviors on these youth and parents over time. The Public Use Files (PUF) containing data for the first three rounds of the survey are now available for download from this site. Each of the three files includes a representative but reduced sample of youth responses for that round. Identifying information and links both to the respondent's data for other rounds of the survey and his/her parent's surveys have been eliminated to protect respondent confidentiality. Selected parent variables have been appended to the records in the file. In 2005, NIDA awarded a contract to the NSPY Center - a joint venture between AMSAQ, Inc. and Westat. The NSPY Center is charged with housing, managing, and analyzing restricted use data collected via the National Survey of Parents and Youth (NSPY) during Phase III of the Evaluation of the National Youth Anti-drug Media Campaign. The National Youth Anti-Drug Media Campaign was funded by the Congress to reduce and prevent drug use among young people by addressing youth directly, as well as indirectly, by encouraging their parents and other adults to take actions known to affect youth drug use. The major intervention components include television, radio, and other advertising, complemented by public relations efforts including community outreach and institutional partnerships. This evaluation report covers the current phase (Phase III) of the project, from September 1999 through December 2001. Recall of Campaign Messages: Most parents and youth recalled exposure to Campaign anti-drug messages. About 70 percent of both groups report exposure to one or more messages through all media channels every week. The average (median) youth recalls seeing one television ad per week. In previous waves less than 25 percent of parents recalled seeing a TV ad every week; this increased to 40 percent in the second half of 2001. Both parents and youth reported substantial recognition of the Campaign's "anti-drug" brand phrases. Effects on Parents: There is evidence consistent with a favorable Campaign effect on parents. Overall, there are favorable changes in 4 out of 5 parent belief and behavior outcome measures including talking about drugs with, and monitoring of, children. Moreover, parents who report more exposure to Campaign messages scored better on those outcomes after applying statistical control for confounders. There is no evidence, yet, of indirect effects on youth behavior as the result of parent exposure to the Campaign. Effects on Youth: There is little evidence of direct favorable Campaign effects on youth. There is no statistically significant decline in marijuana use or improvements in beliefs and attitudes about marijuana use between 2000 and 2001, and no tendency for those reporting more exposure to Campaign messages to hold more desirable beliefs. For some outcomes, and for some subgroups of respondents, analysis raises the possibility that those with more exposure to the specific Campaign ads at the start of Phase III of the Campaign had less favorable outcomes over the following 18 months. This was true for the youth respondents who were nonusers and aged 10 to 12 at the start of this phase, with regard to their intentions to use marijuana in the future and for all youth 12 to 18 for their perceived social norms about marijuana use. Girls with the highest exposure to Campaign ads at the start were more likely than less exposed girls to initiate marijuana use. This effect was not seen for boys. This unfavorable association with initiation was also significant for the youngest respondents and for the low risk respondents. Further analysis is required before any firm conclusion can be reached to support these unlikely outcomes. These interim results reflect the first 2 years of Phase III operation. Subsequent semiannual reports may show different effects (including favorable effects on youth). This report provides followup information on less than half of the entire sample; the rest will be available for the next report. The number one goal of The National Drug Control Strategy is to "Educate and enable America's youth to reject illegal drugs as well as alcohol and tobacco." One of the objectives in support of that goal includes, "Pursue a vigorous advertising and public communications program dealing with the dangers of drugÉ use by youth." Under the Treasury-Postal Appropriations Act of 1998, Congress approved funding (P.L. 105-61) for "a national media campaign to reduce and prevent drug use among young Americans." Pursuant to this act, the Office of National Drug Control Policy (ONDCP) launched the National Youth Anti-Drug Media Campaign (the Media Campaign). The Media Campaign has progressed through three phases of increasing complexity and intensity. Phases I and II are not discussed in this report. ONDCP has available other reports that evaluate those phases. This report focuses on Phase III, which began in September 1999 and is planned to run at least through spring 2003. An evaluation of Phase III is being conducted under contract to the National Institute on Drug Abuse (NIDA) by Westat and its subcontractor, the Annenberg School for Communication at the University of Pennsylvania. Funding of the evaluation is provided by ONDCP from the appropriation for the Media Campaign itself. This is the fourth semiannual report of the Westat and Annenberg evaluation of Phase III of the Media Campaign. The primary tool for the evaluation is the National Survey of Parents and Youth (NSPY). This survey is collecting initial and followup data from nationally representative samples of youth between 9 and 18 years of age and parents of these youth. This Fourth Semiannual Report presents analyses from the first four waves of NSPY, covering the period from September 1999 through December 2001. This executive summary focuses on evidence for Campaign effects on youth and parent outcomes. There have been about 18 months for the Campaign to produce detectable effects on the outcomes since the midpoint of the first wave of interviews, in March 2000, through the midpoint of the fourth wave of interviews, in September 2001. This report includes evidence about temporal changes in behavior and attitudes and beliefs, focusing on changes between 2000 and 2001. The report also includes evidence for cross-sectional association of exposure to Campaign advertising and attitudes and beliefs and, in some cases, behavior. In addition, this report provides, for the first time, evidence from the cohort of youth and parents interviewed during the first half of 2000 and reinterviewed during the last half of 2001. The repeated interviews of the same respondents permits examination of the ability of earlier exposure to predict later outcomes, a stronger procedure for making claims about potential Campaign effects. The next report will strengthen these lagged analyses because the youth and parents first interviewed either in the last half of 2000 or in the first half of 2001 are all being interviewed for a second time during the first half of 2002, thus increasing the sample size for these analyses of temporal ordering. In the subsequent periods, each of these youth and parents will be interviewed for a third time during the final two waves of data collection, that is, between July 2002 and June 2003. The final evaluation report is scheduled for spring 2004. At that time, the sample youth and their parents will have been studied for 2 to 3 years. A brief update and description of the Media Campaign's activities to date. A review of the logic and approach of the evaluation. Statistics on the level of exposure to messages achieved by the Media Campaign during Phase III. Estimates of change in the drug use behaviors of youth between 2000 and 2001. Estimates of Campaign effects on youth from three different approaches: (1) estimates of association between exposure to the Campaign and simultaneously measured outcomes, including attitudes, beliefs, and intentions, with statistical controls for confounders; (2) estimates of change between 2000 and 2001 in these outcomes; as well as (3) estimates of any association of early exposure and later outcomes for the youth interviewed twice. The report also includes analyses of change and of associations for various subgroups of the population. Estimates of Campaign effects on parents. These include association between exposure to the Campaign and parents' talk about drugs with their children, their monitoring of their children's behavior, and their engaging in fun activities with their children, as well as their beliefs and attitudes about talk and about monitoring, and estimates of association between parent exposure and youth drug use behavior. It also includes estimates of trends between 2000 and 2001 in the parent outcomes. Both change and association data are reported for various subgroups of the population. In addition, the lagged associations of early parent exposure to Campaign advertising with later outcomes are presented. Educate and enable America's youth to reject illegal drugs; population. Prevent youth from initiating use of drugs, especially marijuana and inhalants; and population. Convince occasional users of these and other drugs to stop using drugs. The Media Campaign originally targeted paid advertising to youth aged 9 to 18 (with a current focus on youth 11 to 17), parents of youth in these age ranges, and other influential adults. Phase III advertising is being disseminated through a full range of media or "channels" following a Communications Strategy developed by ONDCP. Phase III also includes components other than advertising. There are outreach programs to the media, entertainment, and sports industries, as well as partnerships with civic, professional, and community groups. These other components, which are being coordinated by a public relations firm, include encouraging entertainment programs with antidrug themes, coverage of the anti-drug campaign in the news media, community activities, corporate co-sponsorship, and special interactive media programming on the Internet. The Ad Council, a coordinator of national public interest advertising campaigns, which supervises distribution of donated advertising time to other public service agencies under the "pro bono match" program (see below). For Phase III, advertising space is purchased on television, radio, newspapers, magazines, billboards, transit ads, bus shelters, movie theaters, video rentals, Internet sites, Channel One broadcasts in schools, and other venues as appropriate. The television buys include spot (local), network, and cable television. One of the requirements in the Media Campaign appropriations language is that each paid advertising slot must be accompanied by a donation of equal value for public service messages from the media, known as the pro bono match. The pro bono match involves one-to-one matching time for public service advertisements or in-kind programming. The pro bono spots may include other themes including anti-alcohol, anti-tobacco, and mentoring, but such themes are not part of the paid advertising. The report presents results from four waves of the National Survey of Parents and Youth (NSPY), an in-home survey designed to represent youth living in homes in the United States and their parents. Each of the first three waves of NSPY enrolled nationally representative samples of youth aged 9 to 18 and their parents. The respondents at these waves represent the approximately 40 million youth and 43 million of their parents who are the target audience for the Media Campaign. Wave 1 included 3,312 youth from 9 to 18 years old and 2,293 of their parents, who were interviewed between November 1999 and May 2000; Wave 2 included 2,362 youth and 1,632 of their parents interviewed between July and December 2000. Wave 3 included 2,459 youth and 1,681 of their parents interviewed between January and June 2001. Sampling of eligible youth in Waves 1, 2, and 3 was designed to produce approximately equal-sized samples within three age subgroups (9 to 11, 12 to 13, 14 to 18). One or two youth were randomly selected from each eligible sample household. One parent was randomly chosen from each eligible household. A second parent was selected in the rare event when two youths who were not siblings were sampled. Wave 4 conducted followup interviews with the youth who were sampled in Wave 1 and were still eligible, and with their parents. Later waves will follow up the Wave 4 sample again and also follow up samples from Waves 2 and 3. While the focus of the Campaign is on youth older than age 10, the inclusion of 9- and 10-year-old children at Waves 1, 2, and 3 provides a sample of those who will age into the primary target audience at the times of the followup interviews. Wave 4 comprised followup interviews with 2,478 youth and 1,752 parents of those sampled at Wave 1; the interviews were conducted between July and December, 2001. NSPY achieved a response rate of 65 percent for youth and 63 percent for parents across Waves 1 through 3 of data collection (the recruitment waves), with little response rate variation by wave. In Wave 4, the interviewers for NSPY successfully reinterviewed 82 percent of responding Wave 1 youth who were interviewed in Wave 1 and were still eligible for the survey (primarily still under age 19) and 80 percent of responding Wave 1 parents. The cumulative response rates for Wave 4 were necessarily lower than the rates for the prior three waves due to the followup nature of this wave of data collection. In preparing the respondent data for analysis, adjustments were made at all four waves to compensate for nonresponse and to make certain survey estimates conform to known population values. Confidence intervals for survey estimates and significance tests are computed in a manner that takes account of the complex sample design. NSPY questionnaires were administered in respondents' homes using touch-screen laptop computers. Because of the sensitive nature of the data to be collected during the interviews, a Certificate of Confidentiality was obtained for the survey from the Department of Health and Human Services, and confidentiality was promised to the respondents. All sensitive question and answer categories appeared on the laptop screen and were presented orally to the respondent over headphones by a recorded voice that could be heard only by the respondent. The responses were chosen by touching the laptop screen. The NSPY questionnaire for youth included extensive measurement of their exposure to Media Campaign messages and other anti-drug messages. It also included questions about their beliefs, attitudes, intentions, and behaviors with regard to drugs and a wide variety of other factors either known to be related to drug use or likely to make youth more or less susceptible to Media Campaign messages. The NSPY questionnaire for parents also included measures about exposure to Media Campaign messages and other anti-drug messages. In addition, it included questions about parents' beliefs, attitudes, intentions, and behaviors with regard to their interactions with their children. These included talking with their children about drugs, parental monitoring of children's lives, and involvement in activities with their children. Parent and child responses can be linked for analysis. Ad exposure was measured in NSPY for both youth and parents by asking about recall of specific current or very recent TV and radio advertisements. The TV and radio advertisements were played for respondents on laptop computers in order to aid their recall. Youth were shown or listened to only youth-targeted ads, and parents were shown or listened to only parent-targeted ads. In addition, both youth and parents were asked some general questions about their recall of ads seen or heard on TV and radio, and in other media such as newspapers, magazines, movie theaters, billboards, and the Internet. Across its multiple media outlets, the Media Campaign reports that it purchased enough advertising time over the 28-month period covered by this report (September 1999 through December 2001) to achieve an expected exposure to 2.5 youth-targeted ads per week for the average youth and to 2.2 parent-targeted ads per week for the average parent. These estimates include Campaign advertisements intended for either all youth or all parents; they do not include exposure by youth or parents to advertisements intended for other audiences, often called "spill," or separate advertising targeted to specific race- or ethnicity-defined audiences. Figures ES-1 and ES-2 present the weekly totals for expected youth-targeted and parent-targeted exposures, respectively, where 100 means that the average person in the audience would be exposed once per week. Both the actual weekly media purchases and a smoothed line averaging over 3-week periods are presented. Both graphs show that purchases varied a good deal both between and within the periods corresponding to the NSPY waves of data collection. Table ES-1 summarizes the variations across broad 6-month periods. The table shows that expected weekly exposures of 2.6, 2.5, and 2.8 for youth across the first three waves are followed by a sharp decline in purchases during the second half of 2001, with the average falling below an expectation of 2.0 exposures per week. Purchases of ad time for parents also fell during the second half of 2001; it was also low in the second half of 2000. About 35 percent of youth advertising time was purchased on network or "spot" television and about another 25 percent was purchased on network and "spot" radio. Thus, about 60 percent of total exposures were on media with the potential to reach a wide portion of youth. The rest of the GRPs were purchased on channels that reach narrower audiences, including in-school television (19%), magazines (10%), and other media: basketball backboards, Internet, nontraditional, and arcades (all less that 5% apiece). For parents, averaged across the four waves, almost 60 percent of the primary media buys were in potentially wider-reach media, that is, network radio (30% of all expected exposures) and network television (28%). Forty percent of the primary media buys were in narrower-reach media, that is,outdoor media (26%), magazines (11%), newspapers (4%), the Internet, and movie ads (1%). The decline in total media purchases for parents in the second half of 2001 may have been counterbalanced by the reweighting of the media channels used. While over the first three waves 51 percent of all parent media buys were in wider-reach channels, for the final period 85 percent of buys were in those channels. For both youth and parents, Campaign advertising buys were mostly directed to a small number of platforms or themes. The focus on each platform varied across time, as presented in Tables ES-2 and ES-3, which present the percentage of all television and radio ad buys in each wave dedicated to each platform. For youth, an early focus on Negative Consequences of drug use had almost disappeared by Wave 3 but was revitalized in Wave 4. A focus on Normative Education/ Positive Alternatives was strong across all four waves while Resistance Skills were emphasized in Waves 1 and 3 but not included in Waves 2 or 4. For parents, the Parenting Skills/Personal Efficacy platform was maintained through all four waves and was especially strong in Wave 4. On the other hand, "Your Child at Risk" received substantial weight only at Wave 3, and "Perceptions of Harm" was included only at Wave 1. Some of the "Your Child at Risk" platform advertising in Waves 3 and 4 focused on the risks of inhalants. Anti-inhalant advertising directed toward youth represented less than 0.1 percent of all TV and radio exposures, and even during its heaviest period (the second half of 2001) was only 4 percent of all buys. In contrast, parent-focused anti-inhalant advertising was 11 percent of all purchased radio and television exposures and was included in 43 percent of the ads purchased in the first half of 2001. Ecstasy-focused ads were broadcast only on radio and only during 2001. They made up about 8 percent of all expected exposures during 2001 for parents. For youth, they appeared only in the second half of 2001, making up 10 percent of all exposures during that period. NSPY used two measures of exposure; the first is based on general recall of anti-drug ads through all media, and the second is based on specific recall of currently broadcast ads on television and radio. All of the following results relate only to youth aged 12 to 18 and their parents (i.e., children under 12 in NSPY and their parents are excluded). General exposure recall to all anti-drug advertising was fairly stable for parents and for youth across the four waves. This stability occurred despite the variation in purchases of targeted advertising by the Campaign. The general exposure measures, which may include exposure to advertising targeted to the other audience and advertising placed by other institutions, did not appear to relate closely to changes in Campaign-targeted buys across the four waves. About 70 percent of all parents and 76 percent of all youth recalled weekly exposure to any anti-drug ads (Table ES-4). These estimates suggest that the median monthly exposures are about 10 ads for parents and 13 ads for youth, and the corresponding median weekly exposures are about 2.5 and 3.25 ads. * Significant change between Waves 1 and 2 versus Waves 3 and 4, p<0.05. ** Significant change between Waves 2 and 3, and between Wave 3 and 4 p<0.05. NA: Radio use not measured for youth during Wave 1. Estimates of specific recall of Campaign ads among parents and youth provide an alternative view of exposure to the estimates generated from the general recall measures. Parents reported a median of 3 exposures and youth reported a median of 7.5 exposures to the TV ads "in recent months." This roughly translates into medians of 0.35 and 0.9 exposures per week for parents and youth, respectively. Radio recall was lower than TV recall: On average, over the 2-year period, about 16 percent of parents recalled general exposure to radio ads in the past week, and over the final three waves of measurement about 6 percent of youth recalled such exposure. About 50 percent of parents and 60 percent of youth recalled none of the specific radio ads played for them. As was the case with youth, specific recall of television advertising by parents increased in Wave 4. Although overall parent advertising buys had fallen in Wave 4, television buys were up. This rise in TV buys is consistent with the rise in exposures to specific TV ads. Parent recall of specific radio ads, while still lower than TV ad recall, showed a significant increase between 2000 and 2001, from about 10 percent recalling weekly exposure to about 16 percent. One of the innovations of Phase III has been the inclusion of a Campaign "brand"-for example, "the anti-drug." A brand is used in many advertising campaigns to provide a recognizable element to coordinate advertising as well as nonadvertising components of the campaign. Insofar as the brand is recognized and positively regarded, its familiar presence may create some initial positive response to any new ad or increase the perception that each ad is part of a larger program. Such effects may, in turn, influence acceptance of the Campaign's message. Over Waves 3 and 4 combined, approximately 68 percent of 12- to 18-year-olds recalled the Campaign brand phrase targeted at youth, and 55 percent of their parents recalled the Campaign brand phrase targeted at parents. Because some of the claimed recall could have been due to false recollection, true recall cannot be precisely estimated at this time. There is good evidence that the more individuals were exposed to Campaign advertising the more likely they were to recall the brand phrase, which supports the idea that the phrase was learned as the result of Campaign exposure. Figure ES-3 shows the relationships between recalled exposure of TV ads for youth and TV and radio ads for parents, with the level of brand recognition. For youth, only 39 percent of the lowest TV ad exposure group said they recognized the brand, while 83 percent of the highest exposure group-those who had seen television ads more than 12 times per month-did so. For parents, where recall of both television and radio ads are included in the exposure measure, 35 percent of the lowest exposure group and 74 percent of the highest exposure group recalled the brand phrase. These are large and statistically significant differences. Both youth and parents receive messages about drugs from other public sources besides Media Campaign paid advertising. Those other sources of messages are themselves the target of Campaign efforts, and they also create a context for receiving the Campaign's purchased anti-drug media messages. Exposure to messages through these other sources is high, but, with a few exceptions, there was not much change between waves (Table ES-5). Around two-thirds of youth reported having attended anti-drug education in school during the past year, a rate that remained unchanged across the four waves. Out-of-school drug education was much rarer, and it declined slightly, but significantly from about 8 percent in 2000 to 6 percent in 2001. A little less than one-third of parents reported attending anti-drug and parental effectiveness programs. This did not change across waves. There was a jump in the percentage of parents recalling community-level drug-related discussion of anti-drug programs between Waves 1 and 2, but the percentage had returned to the Wave 1 level by Wave 3 and stayed there for Wave 4. The net result is a small but statistically significant decline in recall between 2000 and 2001. Weekly exposure to mass media stories about drugs and youth was reported by 64 percent of parents. There was little change in this across waves. However, the approximately constant rate of around 53 percent of youth reporting such media exposure in the first three waves of measurement was broken at Wave 4, when it fell to 44 percent. As a result, the rate for 2001 was significantly lower than that for 2000. A slightly increasing proportion of parents reported conversations about drugs with their children across years; in 2000 around 80 percent and in 2001 around 83 percent of parents claimed to have had two or more conversations with their children about drugs in the previous 6 months. There were no important differences in reported conversation with children according to the age of the child. In contrast, youth reported a different pattern of conversation. The percentage of youth reporting such conversations with their parents was lower -- only about 52 percent reported two or more such conversations in the past 6 months. The percentage also declined between 2000 and 2001, a decline that was significant for the entire group of 12- to 18-year-olds and for the 12- to 13-year- olds. In addition, fewer of the younger children (aged 12 to 13) reported such conversations with friends in 2001 than in 2000. Most youth say they have conversations about drugs with parents and/or friends, and many of them have such conversations frequently. The partners for such conversations shift sharply as youth mature. As they mature, youth are less likely to talk with their parents and more likely to talk with friends. * Between Waves 1 and 2 and Waves 3 and 4 change significant at p<0.05. In the course of conversation about drug use, 12- to 18-year-old youth discuss negative things about drugs, but many older youth also speak positively about drugs. Only 9 percent of 12- to 13- year-olds had conversations with the theme "marijuana use isn't so bad" as compared with 44 percent who had conversations about "bad things that happen if you use drugs." In contrast, pro- marijuana conversations are reported by 34 percent of 16- to 18-year-olds, as compared with 55 percent who had conversations about bad things that can happen if you use drugs. There was no substantial change in the balance of pro-drug to "anti-drug" comments between waves. Following the goals of the Media Campaign given earlier, NSPY was designed to assess the influence of the Media Campaign on initial use (i.e., using at least once in a lifetime) and the shift from initial to regular use (i.e., using at least 10 or more times in a year) of marijuana and inhalants. The primary purpose of including questions about drug use in NSPY was not to provide estimates of youth drug use, but rather it was to enable the correlations of cognitive variables (such as attitudes, beliefs, social norms, self-efficacy, and intentions) with actual usage to be studied. Furthermore, NSPY was designed to measure linkages in a theoretical model for Media Campaign action, that is, linkagesbetween ad exposure and attitudes, between attitudes and intentions, and between intentions and actions (drug use). Measures of drug use are needed for an evaluation of this model. Because it has a larger sample and a long trend line, another survey sponsored by the Federal Government the Monitoring the Future (MTF) study provides better measurements of drug use behaviors and changes in them. The National Household Survey of Drug Abuse (NHSDA) also provides important information about drug use and, as a household survey rather than a school survey like MTF, has much in common with the NSPY. However, 2001 NHSDA data are not available. NHSDA 2000 data were presented in the previous semiannual report. The 2001 MTF data, reflecting data collected through the spring of 2001, show a fairly stable pattern of marijuana use since the start of Phase III, and indeed back through 1998 before the start of the national Campaign. The proportions reporting past year marijuana use from 1991 through 2001 are presented in Figure ES-4. The NSPY comparisons between 2000 and 2001, although based on smaller samples, take the use data through the end of 2001. They show essentially the same age differential and trend results as the MTF data: stability in annual marijuana use for all of the age subgroups (Table ES-7). NSPY also examined rates of change in three other measures of marijuana use - ever use, regular use (almost every month), and use in the previous 30 days. For all ages and for all of those measures, use was unchanging between 2000 and 2001, with two exceptions. 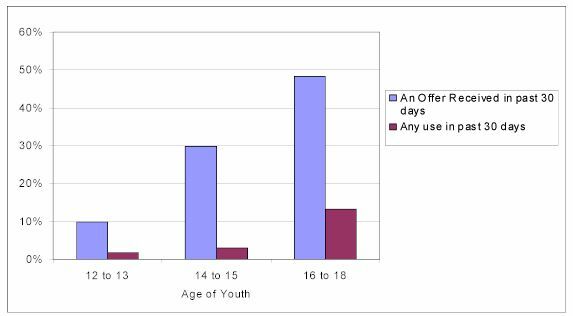 Reports of regular use and last 30 days use, while still rare, were significantly increasing among youth who were 14- to 15-years-old. Reports of past month use increased from 3.6% to 7.2%, and regular use (defined as use every month or almost every month) increased from 2.2% to 5.4%. The remainder of this Executive Summary presents evidence obtained to date regarding Campaign effects. The discussion first summarizes the logic adopted for claiming effects. It then presents the findings regarding Campaign effects on youth followed by the findings for Campaign effects on parents. The analysis of Campaign effects in the report involves three components: (1) examining trends over time, (2) examining how exposure to the Campaign that individuals report is associated with their outcomes measured at the same time, and (3) examining how individuals' reported exposure at one wave predicts their outcomes at a later wave, among youth and parents who were measured at two waves (in this report Waves 1 and 4). If the Campaign has been successful, it would be desirable to see favorable trends in the outcomes over time. However, change in outcomes over time (or a lack of change despite positive Campaign effects) may be due to influences besides the Campaign. Thus, if effects are to be definitively attributed to the Campaign, other supporting evidence is also needed. Another form of evidence is an association between exposure and outcome, measured at the same time. However, evidence of the presence or absence of a simple association is inadequate for inferring that exposure has, or has not, had an effect on an outcome. The main threat to such an inference is that a positive association may be due to the influence of other variables (confounders) on both exposure and outcomes. This threat to inference can be substantially lessened by applying statistical controls for the confounders, as described below. However, even when controls have been applied for all known, measured confounders, there remains the possibility that unmeasured and perhaps unknown confounders are the cause of the adjusted association. Furthermore, even if controls were fully applied for all the confounders, there remains an alternative explanation for the adjusted association, namely that it is outcome that is the cause and (recall of) exposure that is the effect. Thus, an association between exposure and outcome, controlled for all known confounders, cannot alone definitively determine that the campaign has had an effect on an outcome. The threat of ambiguity of causal direction that exists with a cross-sectional association can be overcome when longitudinal data are available. If, after controlling for all confounders, exposure measured at time 1 is associated with outcome measured at time 2, then the causal direction is from exposure to outcome since an effect cannot precede its cause. With this report, longitudinal data are available for the first time. Therefore, it is now possible to establish time order between variables that is, to examine whether a prior state of exposure affects a later outcome measure. There is another constraint on the analysis of associations that needs to be considered. The analysis addresses only the direct effects of exposure. Associations between exposure and outcomes are expected only if individuals personally exposed to Campaign messages learn and accept those messages in the short term. This form of analysis does not reflect any indirect effects that might occur through other routes. Therefore, this report includes analyses that assess only one important route for indirect effects, that is, those mediated through parents. For youth, analyses of Campaign effects are limited to 12- to 18-year-olds who report never having tried marijuana (referred to as "nonusers" in this report) and concerns their attitudes, beliefs, and intentions ("cognitions") about possible initiation of marijuana use in the subsequent year, and in the case of the longitudinal analyses, their actual initiation of use between Waves 1 and 4. There were not enough occasional users (i.e., those using marijuana one to nine times in the past year) among the youth to examine Campaign effects on their cognitions. The parent analysis includes all parents of 12- to 18-year-olds and focuses on the target parenting behaviors (and their supporting cognitions) including talk, monitoring, and engaging in fun projects or activities with their children in or out of the home. In addition, the analyses examine the association between parent exposure and youth behavior. All analyses of associations between exposure to Campaign messages and outcomes use a method called "propensity scoring" to control for the possible influence of a very wide range of possible confounding variables. The analyses began with tests for any preexisting differences among the exposure groups on a large number of variables. The parent analyses were corrected, among other factors, for observed differences on race, ethnicity, gender, age of parent, income, marital status, strength of religious feelings, age of children, neighborhood characteristics, media consumption habits, language, and parental substance use (alcohol, tobacco, marijuana, and other illegal drugs). The analyses of youth associations were controlled for parent characteristics and further controlled for any preexisting difference among exposure groups on school attendance, grade level, academic performance, participation in extra-curricular activities, plans for the future, family functioning, personal antisocial behavior, association with antisocial peers, use of marijuana by close friends, personal tobacco and/or alcohol use of a long-standing nature, and sensation-seeking tendencies. For the cross-sectional analyses, the propensity scores were based on measures of these characteristics taken concurrently with the measures of exposure and outcome. For the longitudinal analyses, these characteristics were measured at Wave 1, concurrently with the exposure measure at that wave, but prior to the Wave 4 outcome measures. The third semiannual report (Hornik et al., 2001) found evidence consistent with a Campaign effect on parents, including evidence of positive change in parent outcomes over the first three waves of measurement, and evidence for cross-sectional associations between exposure and most of those outcomes. The patterns were particularly strong for fathers. In contrast, there was little evidence consistent with a positive Campaign effect on youth. There was little evidence for changes in youth beliefs, attitudes, intentions, or behaviors, or for associations between Campaign exposure and outcomes. The current report extends these analyses to incorporate data from Wave 4 and also adds longitudinal analyses of linked Wave 1 and Wave 4 data for both youth and parents. The analysis focuses on five outcomes for youth: initiation of marijuana use, intentions to avoid initiating marijuana use, and three indices - attitudes and beliefs about marijuana use, perceptions of social norms about marijuana use, and self-efficacy to avoid marijuana use if it is available. The intentions outcome focuses on the proportion of youth who said "definitely not" when asked about the likelihood of their using marijuana in the next year. This measure has proved to be highly predictive of subsequent use. Among nonusing 12- to 18-year-olds at Wave 1 who said they would "definitely not" use marijuana in the next year, 12 percent reported at Wave 4 having ever used marijuana (i.e., 18 months on average after their Wave 1 interview). In contrast, among nonusers who said "probably not," "probably yes," or "definitely yes" to the intentions question, about 45 percent reported having initiated use. The attitude and belief index includes questions about eight specific consequences of marijuana use for the respondent as well as general attitudes toward marijuana use; the perception of the social norms index includes questions about what parents and friends would expect the respondent to do about marijuana use, and the self-efficacy index assesses the respondent's confidence that he or she could refuse marijuana in a variety of circumstances. Each of the three indices is substantially related to intentions to use marijuana. The intentions measure is presented as the percentage of youth who said "definitely" not. The other three indexes are calibrated so all 12- to 18-year-old users at Wave 1 had a mean score of 100 and a standard deviation of 100. Table ES-8 presents a summary of the trend and cross-sectional association data separately for 12- to 13-year-olds and 14- to 18-year-olds. The table shows statistically significant negative trends for 12- to 13-year-olds with regard to (1) attitudes and beliefs, and (2) social norms. The other year-to-year trends are stable. There is only one significant monotonic association,1 which is negative: 12- to 13- year-olds who report higher general exposure measure report less strong rejection of marijuana use in the next year. However, that result is not repeated for the specific exposure index for that age group, and it is not repeated for either exposure measure for the 14- to 18-year-olds. In the absence of any trend data or replication with the other measures or populations, this unlikely finding is probably best interpreted as anomalous rather than as a basis for inferring negative Campaign effects. *Significant change between 2000 and 2001, p<.05. ↓ This arrow indicates that youth with more exposure were less likely to report that they would definitely not use marijuana in the next year. These trend and cross-sectional analyses were repeated for important subgroups defined by gender, sensation seeking (a personality characteristic defined by an interest in engaging in novel, intense, and risky experiences, including illegal drug use), race/ethnicity, and a composite measure of risk of marijuana use. These subgroups were not further subdivided by age. Nine subgroups were analyzed for each of the four outcome measures: for 2000 to 2001 trends, and for the associations between the specific and the general exposure measures and the outcomes. A total of 108 analyses were examined. Of the 108, seven trend or association analyses were significant at the P<0.05 level. Of the seven, three were favorable trends for self-efficacy (among boys, low risk, and low sensation-seeking youth) and three were unfavorable trends for girls (for intentions, and the attitude/belief, and social norm indexes). Only one cross-sectional association was significant out of 72 examined, and that one was unfavorable. A small number of significant effects may be detected when a large number of tests are undertaken, simply by chance. The trends of the negative pattern among girls and for the 12- to 13- year-olds presented previously, and the positive pattern for self-efficacy, are worth some attention. However, absent any credible evidence of association between Campaign exposure and the outcomes, there is no firm basis for a claim of positive (or negative) Campaign effects based on these trend and cross-sectional association data. This report introduced one additional form of analysis: lagged associations. These analyses are restricted to the youth who were interviewed at Wave 1 and again at Wave 4, and who were nonusers at Wave 1 and aged 12 to 18 at Wave 4. The interval between the two interviews was on average 1 years. The analyses ask whether level of exposure to advertising at Wave 1 - both general and specific exposure - predicts subsequent important outcomes. The results for 12- to 13-year-olds at Wave 4 are displayed in Table ES-9, and those for 14- to 18-year- olds are displayed in Table ES-10. The exposure columns represent the level of exposure reported by these youth at Wave 1 to Campaign television advertising. The rows represent measures of four of the five outcomes of interest at Wave 4 for the same youth. The estimates in the cells are adjusted, through the propensity scoring methodology, for a wide variety of potential confounders as well being survey weighted to represent the U.S. population. The statistical significance tests take the complex sample design into account. * Spearman rho is an estimate of the association of two ordered variables and varies between -1 and +1. ** The significance is based on the Jonkheere-Terpstra test for monotonic association. NS denotes not significant at the 5 percent significance level. There is evidence for a lagged association for the 12- to 13-year-olds for both the general and specific measures of exposure with one of the outcomes, intentions, but not for the other three outcomes. This association goes counter to expectation since those with higher exposure at Wave 1 are less likely to report that they do not intend to use marijuana at Wave 4. There is no evidence for a lagged association for the 14- to 18-year-olds for either measure of exposure for any of the outcome measures. That is, regardless of their level of exposure at Wave 1, 14- to 18-year-old youth hold not significantly different scores on each of the outcome measures at Wave 4. There is also evidence of a significant lagged association for the 12- to 18-year-olds between specific exposure and the social norms measure (data only shown in report). Those youth with more exposure at Wave 1 report poorer norms at Wave 4. These unfavorable results were produced through the set of analysis procedures that had been set in place prior to examining the data, as was true for all other reported analyses. However, because these results were contrary to expectations, they stimulated additional analyses to check for their robustness. The results of these alternative procedures found in all cases that the statistically significant negative associations remained. None of the alternative procedures produced any positive Campaign lagged effects. The schedule for this report did not permit further investigation of these results. Wave 5 will provide both a substantially larger longitudinal sample and more time to investigate additional alternative analytic approaches to investigate these effects. The association for the entire sample is not statistically significant. Consistent with the results shown previously, there is a statistically significant association for 12- to 13-year-olds, with higher exposure being associated with a higher proportion of youth initiating marijuana use. This trend is not significant for 14- to 18-year-olds. When the data are presented by gender, males show no effect; however, females show a significant unfavorable association. Low risk youth also show a statistically significant unfavorable association, but high risk youth (a small sample) show no significant association. The results about youth are complex. Unequivocally, there is no evidence yet consistent with a desirable effect of the Campaign on youth. The trends in behavior and in the beliefs that underpin behavior are either flat or, in a few cases, in a direction that suggests that the Campaign is having an unfavorable effect. There is no evidence that those who have been more exposed to the Campaign espouse desired beliefs more than others. And there is no evidence that those who were more exposed to the Campaign at Wave 1 moved subsequently in Wave 4 to more positive views or behavior than those who were less exposed. In addition, there is a suggestion at least for the 12- to 13- year-old subgroup that those who were more exposed to the Campaign moved toward less favorable beliefs, and for 12- to 13-year-olds and for all girls that they had increased levels of initiation. However, a finding that the campaign has an unfavorable effect should be seen as interim, with further elaboration and testing needed. In addition, it will be important to examine whether the apparent unfavorable finding holds up once the full sample is available following completion of the Wave 5 data collection. There are five outcome indices that are the focus of analysis for the parent data in the report: (1) parent reports of talking with their children about drugs; (2) an index of attitude and belief items concerning talk (talk cognitions); (3) parent reports of monitoring their children; (4) an index of concerning monitoring (monitoring cognitions); and (5) parent reports of engaging in fun activities with their children in and outside of the home. As with the youth results, the analyses searched for three supportive findings as the basis for a claim for a Campaign effect: a favorable trend on a target outcome, a favorable cross-sectional association between exposure to the Campaign and the outcome, and evidence for a lagged association between exposure at Wave 1 and outcomes at Wave 4 for the parents interviewed on both occasions (where the associations are controlled for confounders). There was a good basis after Wave 3 to claim some support for an inference of Campaign effects on the first two of those grounds. The inclusion of Wave 4 data supports this position. Table ES-12 summarizes the evidence for the five focus indices for trend and for cross-sectional associations. In two of the cases (talking behavior and cognitions), there is both a significant trend and statistically significant associations with both the general and specific exposure measures for the overall population of parents of 12- to 18-year-olds. For monitoring cognitions, there is a favorable trend and positive associations with general exposure and with specific exposure for fathers. For monitoring behavior, there is a favorable trend, although no overall association of such behavior for either specific or general measures of exposure. However, as was observed during Wave 3, specific exposure is again associated with monitoring behavior for fathers and for parents of male youth. For fun activities, there are clear cross-sectional associations; however, there was no favorable trend overall or for any subgroup. It is worth some emphasis that for both monitoring cognitions and monitoring behavior there are favorable associations with specific exposure for fathers, even when there was no overall association. These results confirm (and incorporate) the results from the previous report. However, the above results do not extend to suggest that parents' exposure has affected youth behavior. There was no cross-sectional associational evidence for any group that parent exposure was associated with lower marijuana consumption among youth. The lagged analyses for parents examined the association of Wave 1 exposure with Wave 4 outcomes, controlling for Wave 1 measures of those outcomes, as well as the set of other potential confounders. The existence of significant associations of parental exposure at the first time point (Wave 1) with parent outcomes at the second time point (Wave 4) would be supportive evidence for a Campaign effect on parents. Table ES-13 summarizes these results. If no significant trend or association for for all parents of 12- to 18-year-olds, is there a significant association for a subgroup of parents? * Significant difference between 2000 and 2001 at p<.05. Yes: Significant monotonic association at P<0.05. --: Subgroup test not statistically different from result for full sample. If the analyses of the above lagged associations had found significant effects, this would have supported a claim that the Campaign caused the outcomes rather than that the outcomes (which represent parent engagement with their children) caused recall of campaign exposure. Either of these interpretations is consistent with the observed strong patterns of cross-sectional associations. Table ES-13 shows that significant lagged associations were not found, except in one case. Thus, these analyses do not provide support for a claim that exposure causes outcomes, rather than outcomes cause exposure. Only in the case of fun activities was the lagged association statistically significant, and that result reflected the difference between the highest level of exposure and the other three categories, which were essentially the same. There is no clear interpretation of these findings. They are consistent with the possibility that the causal chain runs from outcomes to recalled exposure. They are also consistent with the possibility that there was not enough additional influence of Wave 1 exposure over and above that already seen in the Wave 1 outcome to be detected. The parent analyses in this semiannual report had two new elements. The first, just discussed, was the lagged analysis that attempted to help sort through the causal order question. The second innovative element was the incorporation of a youth behavior measure as an outcome in the parent cross- sectional analysis. The youth behavior variable was introduced as an ultimate outcome that extends the evidence for a Campaign effect beyond the associations between exposure and the intermediary outcomes. It was natural to ask the next (and crucial) question as to whether the possible changes produced by the Campaign in the intermediary outcomes had translated into actual behavior change. To date, there is no evidence supporting that claim. Overall, there are trends and cross-sectional associations consistent with Campaign effects on parent outcomes, including talking behavior and cognitions, and monitoring cognitions. These associations are most consistent for fathers. The longitudinal data do not as yet provide the hoped for additional evidence to rule out reverse causation as an explanation for the observed cross-sectional associations. Also, the evidence does not as yet support an effect of parent exposure on youth behavior. This may reflect the apparent lack of relevance of some of the parent outcomes to youth behavior (talking) or the weak associations of exposure and outcome (monitoring behavior). It may also be that the 18-month interval between NSPY Waves 1 and 4 is insufficiently long for the Campaign to have a measurable influence on youth behavior through this indirect parent exposure route. With the next wave of data, the sample for the longitudinal analyses will grow by 150 percent. This may make it possible to detect longitudinal effects, particularly in subgroups, that were not apparent in the limited analyses that could be performed for this semiannual report. Indeed, the parent cross-sectional associations that are described in this chapter appeared only when the Wave 2 and Wave 3 data were joined to the Wave 1 data. A parallel effect may also occur when the full longitudinal sample becomes available. Yet subsequent waves of data collection will increase the time interval between NSPY's youth and parent respondents' first interview and their most recent interview, thereby providing 2 to 3 years to influence youth marijuana use behavior. The Campaign's eventual success depends on its influence on youth behavior. The above discussion of possible effects of the Campaign on youth showed little evidence that youth exposure to the Campaign is as yet affecting their behavior directly. Thus, evidence in this section for effects on parents, and for potential eventual indirect effects on youth, are particularly important. However, the argument for indirect effects requires that there be evidence that parent behaviors are protective, showing that children whose parents talk with them about drugs, monitor them, and engage in fun activities with them are less likely to use drugs. There is good correlational evidence that monitoring (both the behavior and the cognitions) and fun activities are related to drug use behavior and intentions. There is not evidence yet that youth have been affected by parent exposure to the Campaign. In summary, these findings for parents continue to provide some basis for optimism about Campaign effects on parents. Still, there remain possible challenges to claims of Campaign effects. Subsequent reports will be able to investigate these issues more thoroughly. By the end of the evaluation, each respondent will have been measured three times. With those data, claims of effects can be based on a higher standard of inference. Thus, while still subject to future confirmation, at this stage in the Campaign evaluation there are some positive indications of Campaign effects on parents, but not on youth. Hornik, R. et al, (2001). Evaluation of the National Youth Anti-Drug Media Campaign: Third Semiannual Report of Findings,Report prepared for the National Institute on Drug Abuse (Contract No. N01DA-8-5063), Washington DC: Westat. The number one goal of The National Drug Control Strategy is to “Educate and enable America’s youth to reject illegal drugs as well as alcohol and tobacco.” One of the objectives in support of that goal includes, “Pursue a vigorous advertising and public communications program dealing with the dangers of drug… use by youth.” Under the Treasury-Postal Appropriations Act of 1998, Congress approved funding (P.L. 105-61) for “a national media campaign to reduce and prevent drug use among young Americans.” Pursuant to this act, the Office of National Drug Control Policy (ONDCP) launched the National Youth Anti-Drug Media Campaign (the Media Campaign). This program has progressed through three phases of increasing complexity and intensity. Phases I and II are not discussed in this report. ONDCP has available other reports that evaluate those phases. This report focuses on Phase III, which began in September 1999 and is planned to run at least to spring 2002. An evaluation of Phase III is being conducted under contract to the National Institute on Drug Abuse (NIDA) by Westat and its subcontractor, the Annenberg School for Communication at the University of Pennsylvania. Funding of the evaluation is provided by ONDCP from the appropriation for the Media Campaign itself. This is the third semiannual report of the Westat and Annenberg evaluation of Phase III of the Media Campaign. A description of baseline behaviors, beliefs, attitudes, and intentions of both parents and youth. These descriptions focus on the outcomes that will be monitored over time for possible changes that might be brought about by the Media Campaign. This report from the Westat and Annenberg evaluation presents a first round of measurement. It includes early estimates of exposure to the Media Campaign, and it identifies anti-drug beliefs and drug use behaviors that will be watched over time both for movement and for their association with exposure. It thus sets the stage for the evaluation. This report contains no findings about the effectiveness of the Media Campaign. Such findings after only 9 months of operation of Phase III of the Media Campaign would be premature. This reflects both substantive and technical concerns. From the substantive perspective, effects are expected to be achieved and measurable after a longer period of Media Campaign operations. From the technical perspective, there would be little confidence in inferences from a simple cross-sectional analysis, without even accompanying evidence for change over time in outcomes. The first report on tentative analyses of effects will be issued after the next wave of data collection in March 2001. At that time, there will be some evidence presented about changes, if any, in outcome measures like the cognitive variables of interest such as beliefs about the consequences of marijuana use at least once or twice in a lifetime. This evidence about change will be complemented by evidence about association of exposure with the outcome measures. However, it is possible that Media Campaign-produced change will take longer to achieve and/or to detect. Indeed, conclusive evidence will take several years to accumulate and analyze. The final report is scheduled for March 2004. At that time, the sample youth and their parents will have been studied for 3 to 4 years. Evidence for change in the drug use behaviors of youth between Wave 1 and Wave 3, with an average elapsed time between measures of about 12 months. Preliminary evidence for Campaign effects on youth. This includes evidence for association between exposure to the Campaign and beliefs, attitudes, and intentions, with statistical controls for confounders and evidence of change between the first and third waves of data collection on these outcomes. In addition, there is analysis of change and associations among subgroups of the population. Preliminary evidence for Campaign effects on parents. It includes a presentation of evidence for association between exposure to the Campaign and parents’ talk about drugs with their children, their monitoring of their children’s behavior, and their engaging in fun activities with their children, as well as their beliefs and attitudes about talk and about monitoring. It also includes evidence for change between Waves 1 and 3 in these outcomes. Also, both change and association data is reported for some subgroups of the population. The Media Campaign originally targeted paid advertising to youth aged 9 to 18 (with a current focus on youth 11 to 17), parents of youth in these age ranges, and other influential adults. Phase III advertising is being disseminated through a full range of media or “channels” following a Communications Strategy developed by ONDCP. Phase III also includes components other than advertising. There are outreach programs to the media, entertainment, and sports industries, as well as partnerships with civic, professional, and community groups. These other components, which are being coordinated by a public relations firm, include encouraging entertainment programs with anti-drug themes, coverage of the anti-drug campaign in the news media, community activities, corporate co-sponsorship, and special interactive media programming. The Ad Council, a coordinator of national public interest advertising campaigns, which supervises distribution of donated advertising time to other public service agencies under the “pro bono match” program. The report presents results from three waves of an in-home survey covering youth aged 9 to 18 years and their parents. While the focus of the Campaign is on youth older than age 10, the inclusion of 9- and 10-year-old children for initial interviews provides a sample of those who will age into the primary target audience and who will be followed for 2 to 3 years. Wave 1 included 3,312 youth from 9- to 18-years-old and 2,293 of their parents, undertaken between November 1999 and May 2000; Wave 2 included 2,362 youth and 1,632 of their parents interviewed between July and December 2000. Wave 3 included 2,459 youth and 1,681 of their parents interviewed between January and June 2001. These respondents represent the approximately 40 million youth and 43 million of their parents who are the target audience for the Media Campaign. The name of this survey is the National Survey of Parents and Youth (NSPY). NSPY was designed to represent youth living in homes in the United States. Sampling of eligible youth was designed to produce approximately equal-sized samples within three age subgroups (9 to 11, 12 to 13, 14 to 18). One or two youth were randomly selected from each eligible sample household. One parent was randomly chosen from each eligible household. A second parent was drawn in the rare event where the two sample youth were not siblings. The interviewers for NSPY achieved a response rate of 65 percent for youth and 63 percent for parents across Waves 1 to 3, with little variation across waves. Final estimates are adjusted for nonresponse and for differences with known population characteristics, with confidence intervals accounting for the complex sample design. NSPY questionnaires were administered in respondents’ homes on touch-screen laptop computers. Because of the sensitive nature of the data to be collected during the interviews, a Certificate of Confidentiality was obtained for the survey from the Department of Health and Human Services, and confidentiality was promised to the respondent. All sensitive question and answer categories appeared on the laptop screen and were said to the respondent in a recorded voice over headphones that could be heard only by the respondent. The responses were chosen by touching the laptop screen. The NSPY questionnaire for parents also included measures about exposure to Media Campaign messages and other anti-drug messages. In addition, it included questions about parents’ beliefs, attitudes, intentions, and behaviors with regard to their interactions with their children. These included talk with their children about drugs, parental monitoring of children’s lives, and involvement in activities with their children. Ad exposure was measured in NSPY for both youth and parents by playing current or very recent TV and radio advertisements for respondents on laptop computers to aid their recall. Youth were shown or listened to only youth-targeted ads and parents were shown or listened to only parent-targeted ads. In addition, there were some nonspecific questions about recall of ads seen or heard on TV and radio, and in other media such as newspapers, magazines, movie theaters, billboards, and the Internet. except for a planned reduction during the summer of 2000, rose during the first half of Wave 2, and remained fairly high during Wave 3 with a slow decline. Table ES-1 shows that this produced average expected weekly exposures of 2.5, 2.6, and 2.9 across the three waves for youth. Figure ES-2 shows parent-purchased exposures had much more variation. Wave 1 purchases were comparable to those for youth, but declined sharply during Wave 2, particularly at the end of 2000. They began a return to former levels during Wave 3, with the mean weekly purchased exposures at 2.8, 1.5, and 2.4 presented in Table ES-1. Media purchases, as reported by Ogilvy, the media buyer for the Media Campaign, were made both in channels that reached a wide audience (like network, spot television, and radio) and in channels that reached fewer individuals. For adults, averaged across the three waves, about half of the primary media buys were in potentially wider-reach media (network radio (28% of all expected exposures), network television (23%)) and half were in narrower-reach media (outdoor media (32%), magazines (11%), newspapers (4%), the Internet, and movie ads (1%)). For youth, the primary media buys were more weighted toward wider reach media with network television (22%), network radio (19%), spot buys of radio (9%), and spot buys of television (11%) totaling 61 percent of all buys, with 39 percent on narrower reach media: in-school television (17%), in magazines (9%), the Internet (3%), basketball backboards (5%), arcades (2%), and nontraditional media (3%). NSPY used two measures of exposure; the first is based on general recall of seeing anti-drug ads through all media, with the second based on specific recall of currently broadcast ads on television and radio. General exposure recall to all anti-drug advertising was fairly stable for parents and for youth across the three waves. This stability occurred despite the variation in purchases of targeted advertising by the Campaign. These general exposure measures, which may include exposure to advertising targeted to the other audience and advertising placed by other institutions, did not appear to relate closely to changes in Campaign-targeted buys across the three waves. About 71 percent of all adults and 73 percent of all youth recalled weekly exposure to any anti-drug ads (Table ES-2). Specific recall of Campaign ads among parents and youth reflected the changes in television and radio purchases across waves. For parents, specific recall of television ads declined by one-sixth (from 25% to 21%) between Waves 1 and 3. The decline in media purchases in Wave 2 was extended into an effect on recall in Wave 3 despite the increasing purchases during that wave (Table ES-2). Specific recall of radio advertising among parents during the first two waves sharply increased during Wave 3. Specific recall of Campaign ads for youth aged 12 to 18 increased significantly from 35 percent in Wave 1 to 41 percent in Wave 3. The increase in media purchases for youth across the three waves translated into small increases in reports of television exposures between the first two waves and a sharp increase for the third wave (Table ES-2). Youth also reported a sharp increase between Waves 2 and 3 in their recall of the radio ads, although it remained much lower than television ad recall. * Significant change between Waves 1 and 3, p<0.05. ** Significant change between Waves 2 and 3, p<0.05. 1 Respondents during Wave 3 were interviewed throughout the January to June 2001 period; the decline in media purchases was particularly sharp during the final 6 weeks of the Wave 2 period and only gradually climbed back during Wave 3. Study participants were asked about exposure to messages in the months previous to the interview. As a result, the effects of decreasing purchases in Wave 2 were only beginning to be seen for respondents during Wave 2 and were still affecting early Wave 3 respondents. Increasing purchases toward the last half of Wave 3 would not have affected many of the respondents interviewed in the first half of the Wave (see Figure ES-2). NA: Radio use not measured for 9- to 11-year-olds at all and not for other youth during Wave 1. One of the innovations of Phase III has been the inclusion of a Campaign “brand.” A brand is used in many advertising campaigns to provide a recognizable element to coordinate advertising as well as nonadvertising components of the campaign. Insofar as the brand is recognized and positively regarded, its familiar presence may create some initial positive response to any new ad or increase the perception that each ad is part of a larger program. Such effects may, in turn, influence acceptance of the Campaign’s message. Approximately 60 percent of the 12- to 18-year-olds who were asked reported recall of the Campaign brand for youth and 46 percent of the parents recalled the Campaign brand targeted at parents. Because some of the claimed recall could have been due to false recollection, true recall cannot be precisely estimated at this time. There is good evidence that brand recall is associated with exposure to the Campaign. For instance, when one examines the specific exposure recall measure, 33 percent of youth in the lowest exposure group said they recognized the brand, while 79 percent of the highest exposure group did so. For parents, 36 percent of the lowest exposure group and 65 percent of the highest exposure group recalled the brand phrase. The data confirm that Internet use is very high and increasing among 12- to 18-year-olds and even among parents, but a small percentage of youth or parents recall exposure to anti-drug information on the Internet. There were no statistically significant changes between waves in visits to sites where anti-drug information is to be found (“anti-drug sites”) by youth. A close to constant 10 percent or less of youth have visited such anti-drug sites anytime in the past 6 months. Around 5 percent indicate that they have visited pro-drug sites. Parents increased their use of the Internet in the past 6 months from 60 percent at Wave 1 to 70 percent at Wave 3. There was more use of parenting-skill sites (7% to 10%) and anti-drug sites (6% to 9%). Both youth and parent audiences receive messages about drugs from other sources besides Media Campaign paid advertising. Those other sources of messages are themselves the target of Campaign efforts, and they also create a context for receiving the purchased anti-drug media messages. Exposure to messages through these other public sources remains high, but, with a few exceptions, there was not much change in them between waves (Table ES-3). * Significant between Wave1 and Wave 3 change, p<0.05. Most youth report having attended anti-drug education in school during the past year, but this remained unchanged through the three waves. Out-of-school drug education was much rarer, around 7 percent of all youth reported it, and was declining across the three waves. More than half of parents and youth reported weekly exposure to mass media stories about drugs and youth. There was little change in this across waves. Drugs are not only a public topic; they are also a common topic for private conversation between parents and children, and among youth and their friends (Table ES-4). Parents reported a stable level of conversations about drugs with their children across waves; around three-quarters of them claimed to have two or more conversations with their children about drugs in the previous 6 months. Youth reported lower levels of conversation with their parents (closer to one-half recalled two or more conversations in the previous 6 months). Also, fewer of the younger children (9 to 11 and 12 to 13) reported such conversations at Wave 3 than at Wave 1. * Between Wave 1 and Wave 3 change significant at p<0.05. In the course of conversation about drug use, young people of all ages discuss negative things about drugs; but many older youth also speak positively about drugs. For 12- to 13-year-olds, conversations with the theme “marijuana use isn’t so bad” occurred for only 9 percent of the respondents, at about one-fifth the rate (45%)for conversations about “bad things that happen if you use drugs.” Among 16- to 18-year-olds, the pro-marijuana conversations are reported by 34 percent of the respondents, about three-fifths (55%) as often as discussions of the bad things that can happen if you use drugs . There was no substantial change in the balance of “pro-drug” to “anti-drug” comments between waves. Following the goals of the Media Campaign given earlier, NSPY was designed to assess the influence of the Media Campaign on initial use (i.e., using at least once in a lifetime) and the shift from initial to regular use (i.e., using at least 10 or more times in a year) of marijuana and inhalants. NSPY includes questions about drug use primarily so that the correlations of cognitive variables (such as beliefs, attitudes, social norms, self-efficacy, and intentions) with actual usage can be studied. NSPY was also designed to measure linkages in a theoretical model for Media Campaign action: linkages between ad exposure and attitudes, between attitudes and intentions, and between intentions and actions (drug use). Because it has a larger sample and a long trend line, another survey sponsored by the Federal Government—Monitoring the Future (MTF) study—provides better measurements of change in drug use behaviors. The 2001 MTF data are not yet available; the most recent MTF data, showing a fairly stable pattern of marijuana use since the start of Phase III, were included in the previous report. The NSPY comparisons between Wave 1 and Wave 3, although based on smaller samples, show continuing stability in drug use through June 2001 (Table ES-5). * No statistically significant changes across waves. The balance of this Executive Summary presents evidence obtained to date regarding Campaign effects. The discussion first summarizes the logic adopted for claiming effects based on the cross-sectional data collected in the initial three NSPY waves. It then presents the findings regarding Campaign effects on youth followed by the finding for Campaign effects on parents. The report provides an analysis of preliminary Campaign effects. The analysis involves two components: examining change and examining how exposure to the Campaign is associated with outcomes. If the Campaign has been successful, it would be desirable to see positive change in the outcomes. However, change over time in outcomes (or a lack of change despite good Campaign effects) may be due to other influences besides the Campaign. Thus, if effects are to be attributed to the Campaign, there ought to be an association between exposure to Campaign messages and the outcomes. However, evidence of the presence or absence of an association will not be sufficient ground for making a definitive decision about whether effects have occurred. A positive association may be due to the influence of other variables on both exposure and outcomes. This threat to inference can be substantially lessened by statistical controls as described below. An association observed in cross-sectional data may also reflect the influence of the outcome variable on (recall of) exposure. This threat of ambiguity of causal direction is more difficult to reject until longitudinal data are in hand, and it is possible to establish time order between variables—that is, to examine whether a prior state on exposure affects change over time in the outcome measure. There is another constraint as well. The analysis considers only immediate direct effects of exposure on individuals. An association between exposure and outcomes is expected only if individuals personally exposed to Campaign messages learn and accept those messages in the short term. Future reports will examine effects that occur through other routes, including those mediated through parents or other social networks or through institutions. It will also be possible to look at delayed effects. For youth, the analysis is limited to nonusing 12- to 18-year-olds and concerns their attitudes, beliefs, and intentions (“cognitions”) about possible initiation of marijuana use in the subsequent year. There were not enough occasional users (i.e., those using it one to nine times in the past year) among the youth to examine Campaign effects on their cognitions related to regular use. The parent analysis includes all parents and focuses on the target parenting behaviors (and their supporting cognitions) including talk, monitoring, and engaging in fun projects or activities with their children in or out of the home. All analyses of associations between exposure to Campaign messages and outcomes use a method called “propensity scoring” to control for the possible influence of a very wide range of possible confounding variables. The analyses began with tests for any pre-existing differences among the exposure groups on a large number of variables. The parent analyses were corrected, among other factors, for observed differences on race, ethnicity, gender, age of parent, income, marital status, strength of religious feelings, age of children, neighborhood characteristics, media consumption habits, language, and parental substance use (alcohol, tobacco, marijuana, and other illegal drugs). The analyses of youth associations were further controlled for any pre-existing difference among exposure groups on school attendance, grade level, academic performance, participation in extra curricular activities, plans for the future, family functioning, personal antisocial behavior, association with antisocial peers, use of marijuana by close friends, personal tobacco and/or alcohol use of a long-standing nature, and sensation-seeking tendencies. The second semiannual report found some ambiguous evidence about Campaign effects. It found a positive trend from Wave 1 to Wave 2 for youth, but little pattern of association. Contrarily, it found no significant trends for parents, but did find significant associations between Campaign exposure and target outcomes. Of the two, the evidence for parents was more promising. This report provides new information for both audiences. For youth, the positive trends were not maintained in Wave 3; indeed, the levels on the primary outcome variables regressed so that they were no longer different from the Wave 1 levels. There was still no pattern of significant association between exposure and target outcomes for youth. The parents’ results were in sharp contrast. The prior pattern of association was maintained for most outcomes, but now the trend, with 12 months rather than 6 months elapsed time, was also significant for most outcomes. The analysis focuses on four outcomes for youth: intentions to avoid initiating marijuana use and three indices: attitudes and beliefs about marijuana use, perceptions of social norms about marijuana use, and self-efficacy to avoid marijuana use if it is available. The intentions outcome focuses on the proportion of youth who said “definitely not” when asked about the likelihood of their using marijuana in the next year. The attitude and belief index includes questions about eight specific consequences of marijuana use for the respondent as well as general attitudes towards marijuana use; the perception of social norms index includes questions about what parents and friends would expect the respondent to do about marijuana use, while the self-efficacy index assesses the respondents confidence that he or she could refuse marijuana in a variety of circumstances. Each of the three indices are substantially related to intentions to use marijuana, which is closely related to prior marijuana use. Table ES-6 presents a summary of all of the data for 12- to 18-year-olds, broken down between 12- to 13-year-olds and 14- to 18-year-olds. The table finds no significant trends. It finds only one significant association, which is negative. Youth who report more exposure on the general exposure measure report less strong rejection of marijuana use in the next year. However, that result is not repeated for the specific exposure index, and it is not repeated for the 14- to 18-year-olds nor when all of the youth are combined. In the absence of any trend data or replication with the other measures or populations, the result is appropriately seen as anomalous rather than as a basis for a negative inference about the Campaign effects. † A monotonic dose-response relationship is where increasing the dose never reverses the direction of the effect. In this case, it means that higher recall of anti-drug advertising never was associated with a reversal of the effect of exposure on outcomes. * shows that the monotonic dose-response relationship was decreasing. Youth with more exposure were less likely to report that they would definitely not use marijuana in the next year. These trend analyses were repeated for important subgroups defined by gender, sensation seeking (a personality characteristic defined by an interest in engaging in novel, intense and risky experiences, including illegal drug use), race/ethnicity, and urbanicity. Ten subgroups were analyzed for each of the four outcome measures, for Wave 1 to Wave 3 trends, and for association between the specific and general exposure measures and the outcomes. That meant a total of 120 analyses were examined. Of those, five trend or association analyses were significant at the p<0.05 level, about the same number as one would expect by chance. Of the five, three were consistent with a positive Campaign effect and two were consistent with a negative Campaign effect. The conclusion was that there is no reliable evidence of Campaign effects among subgroups. The samples for most analyses are substantial and were designed to be sensitive to changes of a specific size both for the overall sample and for important subgroups. Whatever the sensitivity, however, it is always possible that the Campaign achieved effects that were smaller than could be detected reliably by the available samples. This possibility is magnified for subgroup analyses that may depend on only a portion of the entire sample. The effects of the Campaign may take longer to appear than the time that has passed since the start of Phase III. Youth have already been exposed to many anti-drug messages through other sources. The incremental effect of the Campaign-associated exposure may not be enough to achieve short-term effects, although it may have longer term cumulative effects. The effects of the Campaign may not be felt solely through the influence of individual exposure to ads affecting those individuals’ beliefs and behavior. Rather, the effects may occur through a combination of direct and indirect exposure. The indirect exposure occurs when others in the youth’s social network are exposed and diffuse what they hear and see to the youth; it occurs when parents see the ads and are influenced in their interactions with their children; and it occurs when other adults in the community see the ads and other anti-drug promotion information, and are encouraged to support anti-drug public policies and anti-drug actions of community institutions. None of these indirect routes are fully tested in this volume. The included analyses are aimed at capturing direct effects only. The analyses in this volume compare individuals with more or less personal exposure. There is some preliminary evidence that parent exposure affects parent outcomes, and that some of those outcomes are related to youth behavior. However, that analysis does not establish the relation between parent exposure and youth outcomes. This will be examined in future reports. In summary, thus far there is relatively little evidence for direct effects of the Campaign on youth. While there are scattered significant positive results, they are balanced by scattered significant negative results. Beginning with the Wave 4 semiannual report, there will be followup interviews available with youth measured at Wave 1, and at Wave 5 there will be followup for the samples from Wave 2 and Wave 3. Also, the evaluation will cover a longer period of Phase III of the Campaign. Both of these will make it possible to look for evidence of effects in additional ways, including comparing the rates of changes in outcomes for those with lower and higher early exposure and examining possible indirect effects. They may open the possibility of a modification of these conclusions. The parent data provide a different and positive result. There were five outcome indices that were the focus of analysis in the report: (1) parent reports of talking with their children about drugs; (2) an index of belief and attitude items concerning talk (talk cognitions); (3) parent reports of monitoring their children; (4) an index of beliefs and attitudes concerning monitoring (monitoring cognitions); and (5) parent reports of engaging in fun activities with their children in and outside of the home. There is evidence for positive trends between Waves 1 and 3 for four out of five of these indices. Either there was a statistically significant Wave 1 to Wave 3 positive trend overall, or among one or more important subgroups. The only exception was for the fun activities index, which showed no detectable change overall or for any subgroup. Table ES-7 summarizes the statistically significant results. In the case of monitoring behavior, there was an overall significant trend, so none of the trend data for subgroups are displayed. In the case of monitoring cognitions and talk behavior and cognitions, the overall trend was positive but not statistically significant, so several subgroups with significant trends are presented. There was clearly substantial evidence for positive trends between Waves 1 and 3. In addition, there was strong evidence of association between the exposure measures and the outcomes: for the entire population, both the general and specific exposure measures were associated with level of talking behavior and cognitions, and fun activities. Monitoring cognitions was associated with general exposure for everyone, although the specific exposure measure was only significantly associated for fathers. Fathers were also the only subgroup to show a significant association of exposure (in this case specific exposure) and monitoring behavior. The number one goal of The National Drug Control Strategy is to "Educate and enable America’s youth to reject illegal drugs as well as alcohol and tobacco." Objectives in support of that goal include "Pursue a vigorous advertising and public communications program dealing with the dangers of drug, alcohol, and tobacco use by youth." Under the Treasury-Postal Appropriations Act of 1998, Congress approved funding (P.L. 105-61) for "a national media campaign to reduce and prevent drug use among young Americans." Pursuant to this act, the Office of National Drug Control Policy (ONDCP) launched the National Youth Anti-Drug Media Campaign (the Media Campaign). This program has progressed through three phases of increasing complexity and intensity. Phases I and II are not discussed in this report. ONDCP has other reports available that evaluate those phases. This report focuses on Phase III, which began in September 1999 and is planned to run at least until 2003. An evaluation of Phase III is being conducted under contract to the National Institute on Drug Abuse (NIDA) by Westat and its subcontractor, the Annenberg School for Communication at the University of Pennsylvania. Funding of the evaluation is provided by ONDCP from the appropriation for the Media Campaign itself. This is the first semi-annual report of the Westat and Annenberg evaluation of Phase III of the Media Campaign. The Media Campaign targets paid advertising at youth aged 9 to 11, 12 to 13, and 14 to 18, parents of youth in these age ranges, and other influential adults. Phase III advertising is being disseminated through a full range of media or "channels" following a Communications Strategy developed by ONDCP. Phase III also includes components other than advertising. There are partnerships with the media, entertainment and sports industries, as well as civic, professional, and community groups. These other components, which are being coordinated by a public relations firm, include encouraging entertainment programs with anti-drug themes, coverage of the anti-drug campaign in the news media, community activities, corporate co-sponsorship, and special interactive media programming. Fleishman-Hillard, a public relations firm, which coordinates the non-advertising components of the Media Campaign. For Phase III, advertising space is purchased on television, radio, newspapers, magazines, billboards, transit ads, bus shelters, movie theaters, video rentals, Internet sites, Channel One broadcast in schools, and other venues as appropriate. The television buys include spot (local), network, and cable television. One of the requirements in the Media Campaign appropriations language is that each paid advertising slot must be accompanied by a donation of equal value for public service messages from the media, known as the pro bono match. The pro bono match involves one-to-one matching time for public service advertisements or in-kind programming. The pro bono spots may include anti-alcohol, anti-tobacco themes, and mentoring, but such themes will not be part of the paid advertising. The report presents results from an in-home survey of 3,312 youth from 9 to 18 years old and 2,293 of their parents undertaken between November 1999 and May 2000. These respondents represent the approximately 40 million youth and 43 million of their parents who are the target audience for the Media Campaign. The name of this survey is the National Survey of Parents and Youth (NSPY). NSPY was designed to represent youth living in homes in the United States. Sampling of eligible youth was designed to produce approximately equal sized samples within three age subgroups (9-11, 12-13, 14-18). One or two youth were randomly selected from each eligible sample household. One parent was randomly chosen for each eligible household. A second parent was drawn in the rare event where the two sample youth were not siblings. The interviewers for NSPY achieved a response rate of 64 percent for youth and 61 percent for parents. Final estimates are adjusted for nonresponse, for differences with known population characteristics, with confidence intervals accounting for the complex sample design. NSPY questionnaires were administered in respondents’ homes on touch-screen laptop computers. Because of the sensitive nature of the data to be collected during the interviews, a certificate of confidentiality was obtained for the survey from the Department of Health and Human Services, and confidentiality was promised to the respondent. All sensitive questions and answer categories appeared on the laptop screen and were said to the respondent in a recorded voice over headphones that could only be heard by the respondent. The responses were chosen by touching the laptop screen. The NSPY questionnaire for youth included extensive measurement of their exposure to Media Campaign messages, and other anti-drug messages, their beliefs, attitudes, intentions, and behaviors with regard to drugs and a wide variety of other factors either known to be related to drug use or likely to make youth more or less susceptible to Media Campaign messages. The NSPY questionnaire for parents also included measures about exposure to Media Campaign messages, and other anti-drug messages. In addition, it included questions about their beliefs, attitudes, intentions, and behaviors with regard to their interactions with their children. These included talk with their children about drugs, parental monitoring of children’s lives, and involvement in activities with their children. Ad exposure was measured in NSPY for both youth and parents by playing TV and radio advertisements for respondents on laptop computers to aid their recall. The NSPY questionnaires and procedures were designed to mesh well with the nature of the Media Campaign. Production of commercials is frequently finished only days before they go on the air and the commercials change often. Every 2 months, a CD-ROM of new ads is distributed to the interviewers. Also, a new schedule of planned air dates is distributed by email every month. At the time of interview, the computer calculates which ads were scheduled to be on the air during any part of the 2 calendar months preceding the month of interview. A sample of these ads was then shown to the respondent. When the data were processed, data about an ad were kept only if the final air dates included at least 1 day in the 60 days leading up to the date of interview. Thus, everyone in the sample was measured with respect to advertising that was current at the time of their interview. The Media Campaign included ads aimed at youth and ads aimed at parents. In NSPY, youth were only shown youth-targeted ads and parents were only shown parent-targeted ads. Every youth and parent was also shown a TV "ringer ad," an ad that had an anti-drug message but for various reasons had never been aired on TV. These ringer ads were included as a tool for assessing the quality of ad recall by respondents. In addition, there were some unaided questions about recall of ads seen or heard on TV and radio, and in other media such as newspaper, magazines, and billboards. Following the goals of the Media Campaign given earlier, NSPY was specifically designed to assess the particular influence of the Media Campaign on trial (i.e., using at least once in a lifetime) and regular use (i.e., using at least 10 or more times in a year) of marijuana and inhalants. NSPY includes questions about drug use primarily so that the correlations of cognitive variables with actual usage can be studied. It was also designed to measure linkages in a theoretical model for Media Campaign action: linkages between ad exposure and attitudes, between attitudes and intentions, and between intentions and actions (drug use). Because they have larger samples and long trend lines, two other surveys sponsored by the federal government – the National Household Survey on Drug Abuse (NHSDA) and Monitoring the Future (MTF) study – provide better measurements of change in drug use behaviors. Nonetheless, it is interesting to compare NSPY estimates with those of other surveys. Some comparisons are made in Chapter 6 of this report, but they are difficult to interpret because of confounding with time. Estimates for early 2000 will not be available from the other surveys until late 2000 and mid-2001. In general, NSPY estimates for early 2000, displayed in Table ES-A, tend to be comparable to the most recent (1999) NHSDA marijuana estimates and lower than the estimates from the most recent (1999) MTF study. This may be because NHSDA and NSPY are both household surveys whereas MTF is a school-based study. The set of youth who participate in household surveys is somewhat different than the corresponding set for school-based studies, and youth may feel different constraints or pressures on their reporting in the different environments. The available data from the 1999 MTF study suggest that marijuana use has been stable since 1998. However, those data were collected in the spring of 1999; it is too early to have expected to see any effects of the Phase III Media Campaign. The estimates from NSPY for both marijuana and inhalant use among youth in early 2000 are presented in Table ES-A. Consistent with findings from other surveys, usage increases with age and marijuana is much more popular than inhalants. Regular use of inhalants is a rare behavior. Since parents are also interviewed in NSPY, it is possible to contrast parent knowledge of drug usage by the youth with what the youth reports. As shown in Table ES-B, fewer parents report drug use by their children in the last year than youth do themselves. However, the gap is not very wide until the youth are 16 to 18. The gaps for inhalants (not shown) are much narrower. Youth receive many offers of marijuana, but they claim they rarely accept. Almost 50 percent of youth aged 16 to 18 have received a marijuana offer in the past 30 days. In contrast, just 13 percent of youth aged 16 to 18 report having smoked marijuana in the past 30 days. See Figure ES-A. Analyses presented here separate non-users from occasional users and deal separately with ideas about trial and regular use. Non-users are defined to be youth who have never tried marijuana. Occasional users are those who have used marijuana 1 to 9 times in the past 12 months. There are also regular users (10 or more uses in last 12 months) and former users (lifetime trial but no usage in last 12 months), but these groups are too small for separate reporting. Among 9- to 11-year-old non-users, beliefs were strongly negative toward trial use of marijuana. On a 1- to 7-point attitude scale, where 7 indicates a strongly negative attitude, their mean response was 6.8. However, they are not convinced about the gateway hypothesis that marijuana usage leads to or causes its users to progress to harder drugs. Only 18 percent strongly believe that marijuana trial would make them go on to use harder drugs. Older non-using teens also generally expressed negative attitudes and beliefs about trial marijuana use, but they were less consistent than the 9- to 11-year-olds. While their mean attitude was strongly negative (6.6), and almost all of them were definitely not intending to even try marijuana in the next year (92% of 12-13 year olds and 83% of 14-18 year old non-users ), the older they were the less likely they were to see all aspects of marijuana trial as completely negative. Perception of use by friends and peers increases sharply with age. Among youth aged 14 to 18, 69 percent (vs. 94% of 12- to 13-year-olds) believe that none or a few of their friends have tried marijuana and just 29 percent (vs. 75% of 12- to 13-year-olds) believe that none or a few of "other kids in their grade in school" have tried marijuana. The majority believe that more than a few of their peers have tried marijuana. Almost all non-using youth agreed that their parents would strongly disapprove of their own (the youth’s) marijuana trial. Only 7 percent thought otherwise. There was no significant pattern in this belief by the age of the youth. With respect to getting in trouble with the law, 45 percent of non-using youth aged 12 to 13 viewed this is as a very likely outcome of trial use. The corresponding percentage was just 32 percent for non-using youth aged 14 to 18. With respect to being like the coolest kids, 63 percent of non-using youth aged 12 to 18 viewed this is as a very unlikely outcome of trial use. With respect to friends approval of marijuana trial, 77 percent of non-using youth aged 9-11 expect strong disapproval from their friends if they were themselves to try marijuana. This figure does decline with age. Among non-users aged 12 to 13, the percentage is 69, and among non-users aged 14-18, it falls to 54 percent. Beliefs about consequences of regular marijuana usage (i.e., monthly or more frequent use) among non-users are generally more strongly anti-drug than their attitudes toward trial use. Ninety-eight percent of non-using 12- to 13-year-olds, and 95 percent of non-using 14- to 18-year-olds say "definitely not" when asked about their likelihood of using marijuana regularly in the next year. A majority of non-using youth aged 12 to 18 believe it very likely that regular use would lead them to damage their brains, "mess up" their lives, and do worse in school. Also, a majority of non-using youth aged 12 to 18 believe that regular use would be very unlikely to make them more creative and imaginative. However, regular marijuana use is not strongly disassociated from good times. Just 35 percent of youth aged 14 to 18 believe that marijuana use would be very unlikely to help them have a good time with their friends. Not surprisingly, current occasional users of marijuana held sharply less critical views of the consequences of regular use. Nonetheless, around 55 percent of the 14- to 18-year-old occasional users said they were definitely not intending to start regular usage. Parents report that they already often engage in the behaviors that are the primary targets for the parent segment of the Media Campaign. However, they report much higher levels of these behaviors than do the independent reports of their children. Parents say they are talking with their children about drugs. About 91 percent report having talked with their 9- to 18-year-old child at least once in the previous 6 months about drugs, and 77 percent report having talked at least twice. Children report fewer conversations overall. The gap increases with age as shown in Table ES-C. Among teens aged 16-18, just 48 percent report 2 or more conversations with their parents about drugs. Strikingly, more than 90 percent of the parents report talking with their 16- to 18-year-old children about the anti-drug ads (Table ES-D). However, only 21 percent of the children recalled a conversation about anti-drug ads. Parents say they are doing a good deal of monitoring of their children’s lives. Children often disagree with this assessment, but the two reports grow closer together as children age, as shown in Table ES-E. The gap narrows because parents report less monitoring as their children grow older. Almost all parents report they engage in fun activities with their children. Nearly all parents of 9- to 18-year-olds (90.5%) claimed to have done some home (81.7%) and/or out-of-home fun activity (76.4%) with their child in the past week. There are no parallel youth data for comparisons. In addition to asking parents about past conversations with their children about drugs, the NSPY questionnaire includes questions about intentions for future conversations, attitudes about conversation, perceived social expectations for them to have such conversations, and feelings of self-efficacy to have such conversations. Similarly, in addition to questions about past monitoring of their children, there are questions about intentions for future monitoring, attitudes about monitoring, and likely consequences of future monitoring. The majority of parents expressed strong intentions to talk about drugs with their child as well as to monitor their children. This is consistent with their behaviors. There may be some room for movement on some specific types of monitoring behaviors or for talk about specific topics. These question arrays will be most interesting to analyze in association with exposure levels to advertising as will be done in the next report. However, one interesting early finding shown in Table ES-F is that parents were not strongly convinced that their monitoring would affect their children’s likelihood of using drugs. Only 52 percent of parents of 12- to 13-year-olds strongly agreed that monitoring would "make it less likely my child will use any drug nearly every month." Moreover, they perceived obstacles and unpleasantness. Eighty-four percent of parents of youth aged 14 to 18 expressed at least some concern that their children would view close monitoring of the child’s daily activities as an invasion of privacy. Even among parents of children aged 9 to 11, only 25 percent strongly dismissed privacy concerns. Note: NA – This question not asked of parents of 9- to 11-year-olds. Most parents think their children will not use drugs in the future as shown in Table ES-G. Among parents of 12- to 13-year-olds, 86 percent were adamant that their children would not use marijuana at all in the next year; that proportion declined to 70 percent among parents of 16- to 18-year-olds. Youth agree with this assessment at ages 12 through 15, but youth 16 to 18 are less certain that they will avoid all marijuana usage. Parents and youth were in better agreement about regular usage of marijuana than about any usage, as shown in Table ES-H. Interestingly, parents of youth aged 12 to 15 are a little less confident that their children will avoid regular marijuana usage than are the youth themselves. Parents tend to discount the possibility of any usage more strongly than do youth, but youth discount the possibility of regular usage more strongly. Across its multiple media outlets, the Media Campaign reports that it purchased enough advertising time to achieve an expected exposure to 2.3 youth-targeted ads per week for the average youth and to 2.7 parent-targeted ads per week for the average parent over the 39-week period covered by this report (September 1999 through May 2000). Each group may have been exposed to ads targeted to the other group, as well. These statistics do not include "spill," which is defined to be youth viewing of ads targeted at parents or parent viewing of ads targeted at youth. For adults, the primary media buys, as reported by Ogilvy, the media buyer for the Media Campaign, were in outdoor media (39%) network radio (28%), network television (20%), magazines (8%), and newspapers (5%), where the percentages refer to the percent of exposures that are projected to occur through each channel. For youth, the primary media buys, as reported by Ogilvy, were on network television (24%) and network radio (22%) with the rest on in-school television (16%), spot buys of radio (8%) and television (11%) and in magazines (10%). About half of the media buys for adults were on channels with the potential to reach most of the population. About two-thirds of the buys for youth were on channels with the potential to reach most of the population. Using general exposure measures, and summing across all media, 90 percent of parents and 93 percent of youth recalled exposure to one or more ads each month. Sixty-eight percent of parents and 70 percent of youth recalled exposure to one or more ads each week. The median recall by parents was 10 ads per month (i.e., at least half of parents saw 10 or more per month and at least half saw 10 or fewer). The median recall by youth was around 11 ads per month. The median aided recall of specific TV ads by youth was 4 exposures in recent months. This is roughly equivalent to 0.5 exposures per week. Thirty-five percent reported weekly television ad exposure or more. Eighteen percent recalled none of the TV ads. Exposure of youth was thus fairly uneven. The median aided recall of specific TV ads by parents was 3 exposures in recent months. This is roughly equivalent to 0.35 exposures per week. Twenty-five percent reported exposure once per week or more. One-third of the parents recalled none of the TV ads. Exposure of parents to TV advertising was thus lighter than for youth and very uneven. The median aided recall of specific radio ads by parents was 0 exposures in recent months. Ten percent reported exposure once per week or more. Fifty-two percent of the parents recalled none of the radio ads. Exposure of parents to radio ads was thus minimal. The majority of parents either never heard the radio ads or heard them only rarely. Youth radio advertising largely consisted of the soundtracks of television ads and this did not permit an independent estimate of exposure to radio-specific advertising. The NSPY measures of aided recall for specific ads correlate well with the Ogilvy data based on purchasing patterns and general media consumption. Ads that should have higher viewership levels based on Ogilvy data usually have higher NSPY exposure estimates. Also, the recall of real ads by youth was much higher than the recall of the "ringer" ads. Both parents and youth gave moderately favorable evaluations of the ads they recalled (around 1.0 on a scale from –2 to +2) with respect to power to attract attention, power to convince, and having content that was personally important. Neither parents nor youth felt that the ads exaggerate the problem. Strikingly, even occasional users of marijuana aged 14 to 18 tended to disagree with the statement that the ads "exaggerate the problem." The data confirm that Internet use is very high among 12- to 18-year-olds and even among parents. But this does not translate into exposure to anti-drug information. Visits among youth to sites where anti-drug information is to be found is still quite uncommon; 10 percent or less of youth have visited such sites even once in the past 6 months. Visits to sites with pro-drug information are less common than to sites with anti-drug information among 12- to 13-year-olds. Parents use the Internet less than their children and recall visits to anti-drug sites and to parenting-skill sites with less frequency than their children visited anti-drug sites. Both youth and parent audiences receive messages about drugs from other sources besides Media Campaign paid advertising. Most youth report receiving anti-drug education in school during the past year and in previous years. More than three-quarters of all youth report in-school drug education by the time they are 18, with 60 to 76 percent of all children 12 and older saying they attended such a program within the past year. However, many fewer youth report that their involvement with extracurricular activities has led to anti-drug education. Only 12 percent have ever participated in anti-drug programs or discussions outside of school, and only 8 percent have participated in such programs within the past year. Youth see and hear a good deal about drug use among young people in the mass media.More than half of all youth noticed media coverage about drug use among young people at least once a week. Most older youth have conversations about drugs, and many of them have such conversations frequently. More than half of youth aged 12 to18 report having such conversations with parents or friends four or more times in the previous 6 months. The partners for such conversations shift sharply as youth mature with parents replaced by friends. Among 9- to 11-year-olds, 35 percent had four or more conversations with parents, but only 15 percent had four or more conversations with friends. Among 16- to 18-year-olds these numbers are reversed: 22 percent had four or more conversations with parents, but 46 percent had that many conversations with friends. In the course of conversation about drug use, young people of all ages discuss negative things about drugs. But, many older youth also speak positively about drugs. For 12- to 13-year-olds, conversations with the theme "marijuana use isn’t so bad" occurred for only 10 percent of the respondents, at about one-fifth the rate as conversations about "bad things that happen if you use drugs." Among 16- to 18-year-olds the pro-marijuana conversations are reported by 32 percent of the respondents, about three-fifths as often as discussions of the bad things that can happen if you use drugs. Parents report high basic awareness of anti-drug activities taking place in their communities. For example, more than 80 percent know at least a little about anti-drug programs in schools or community centers. Parents, like their children, often see drug themes presented in the media. More than 90 percent of parents report at least monthly exposure and 65 percent report weekly exposure to at least one media source dealing with the issues of youth and drugs. Fewer than half of parents report having attended drug prevention or parent effectiveness programs. Twenty-six percent reported attendance at a drug abuse prevention activity in the previous 6 months. About the same number (29%) said they attended a parent effectiveness program in the previous year. This first semi-annual report from NSPY describes the Media Campaign, provides some measures of exposure to Campaign advertising over the first 9 months of Phase III, and has set a baseline for cognitive parent and youth attributes and for parent and youth behavior. Most youth express negative attitudes and negative beliefs about the consequences of marijuana use, both with regard to trial use, and more strongly about regular use. Older youth tend to have less consistently negative attitudes. Youth tend to disbelieve the gateway theory that marijuana usage will lead to usage of harder drugs. Parents say that they talk about drug use with and that they monitor their children. They are not altogether convinced that monitoring protects against drug use. Parents report more frequent conversations and monitoring behavior than do their children. New estimates of youth usage of marijuana and inhalants have been presented. Regular inhalant usage is rare. The marijuana estimates are generally consistent with estimates from NHSDA. Most parents and youth have seen at least some of the ads, with one estimate suggesting both audiences are exposed to 2 or 3 ads per week across all media. Another approach puts the estimate for television advertising alone per week at 0.5 exposures for youth and 0.3 for parents. Some parents and youth have seen the ads much more often than other parents and youth. The parent radio Media Campaign has low awareness. Initial respondent reactions to the TV ads are generally favorable. Few youth or parents report exposure to anti-drug web sites on the Internet. No inferences about the effectiveness of the Media Campaign have been drawn in this report. Given that Phase III of the Media Campaign was only 9 months old by the end of Wave 1 data collection for NSPY, such inferences would be premature. Also, the most telling measurements have not yet been made. There will be a series of six more semi-annual reports over the next few years, culminating in a final report in March 2004. Indirect effects of the Media Campaign on youth through parents, friends, and institutions.